Now that swine flu hysteria is close to full bloom, I dug into the old photo archive and pulled up this classic set of instructional posters from SARS-era Shanghai. 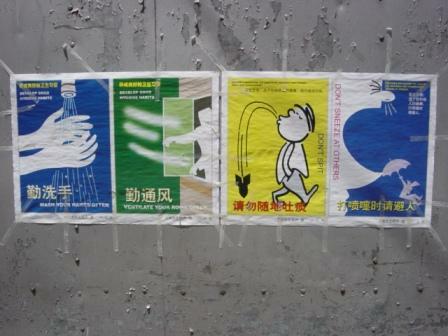 For a couple of months during Winter/Spring 2003, these were pasted everywhere – every spare wall (anybody out there remember if these showed up in other Chinese cities? or were there different posters?). The Shanghai posters became hot collectors items after the pandemic fears subsided. And, to this day, I regret not grabbing a set for myself. Two additional SARS-related recollections after the jump …First – because most of the population followed government instructions and stayed home, Shanghai took on an idyllic quality. I distinctly recall strolling down Nanjing Road on a Sunday afternoon and being able to count the number of other pedestrians in sight of me (by way of comparison: you’ve be hard-pressed to count the pedestrians within three meters of you on any normal Sunday). Subways were empty, even at rush hour, and the air quality was startlingly clear. When I’ve discussed this period with other expats who remained here, they all get the same winsome, far-away eyes: it was an odd, but indisputably low-key and pleasant period in the city’s history. That’s not to make light of it, or the precautions that others felt necessary to take. It’s just to note that – due to pandemic fears – Shanghai felt more like Duluth than Chongqing. 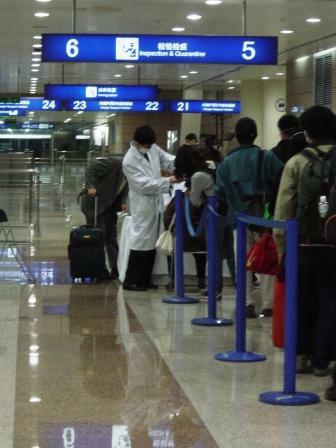 We proceed in a somber single-file line, but just before reaching the customs desk, we are halted by two temporary checkpoints staffed by masked individuals in white lab coats. Conversation ebbs immediately and disappears entirely. The only remaining voices are those requesting that passengers submit to a thermometer in the ear. The reading takes a few seconds, and when no fever registers, I am directed to customs. As an officer examines my passport, I look back and see a woman diverted from the thermometer line for further examination due to a mild fever. I pause: On the plane she had occupied a seat three rows ahead of me. But it’s no matter. My passport is stamped, and I am free to enter China. The lasting legacy of the SARS-era health checks were the much-hated health forms filled-out by incoming passengers until they suspension in January 2008 (I blogged about the subject in December 2007, here). SCMP reports that Hong Kong, badly damaged by the SARS outbreak, resumed intense health screening of passengers over the weekend; it’ll be interesting to see if and when the Chinese do the same. 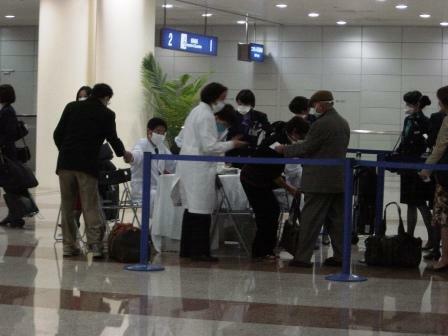 Below, a couple of images of the health checks to which incoming international passengers were subjected at Shanghai Pudong Airport in April 2003. To be clear: these were very, very serious and thorough. There was nothing perfunctory about them at all. This entry was posted in Expat Life, Health, US-China Policy by Adam. Bookmark the permalink. As far as I can remember, there weren’t any signs around Hangzhou during SARS, although room ventilation seemed a common thought here before that anyway – windows always open winter and summer, meanwhile everyone complaining its too hot or cold. I got married over the worst weekend in the Hangzhou SARS calendar, which was a blessing in a way – we got meals, limo etc at rock bottom price because everyone else cancelled. Only bad thing was a girl in our office hot it (supposedly), so everyone else in the office was confined to home for 14 days to make sure they didn’t have it…so I spent most of my honeymoon locked up in our 100sqm apatrment with my parents. Beijing was idyllic too!! misty eyes.. for sure… became good friends with a guy who jumped the wall of his teacher dorm and went traveling to Huangshan, Jiuzhaigou etc. rather than be locked up… admired his spirit. Don’t remember posters though.. but i do remember everyone with Kao Zhao – umm. facemasks!! bizarre.. There were similar posters all of the place here in Guangxi.